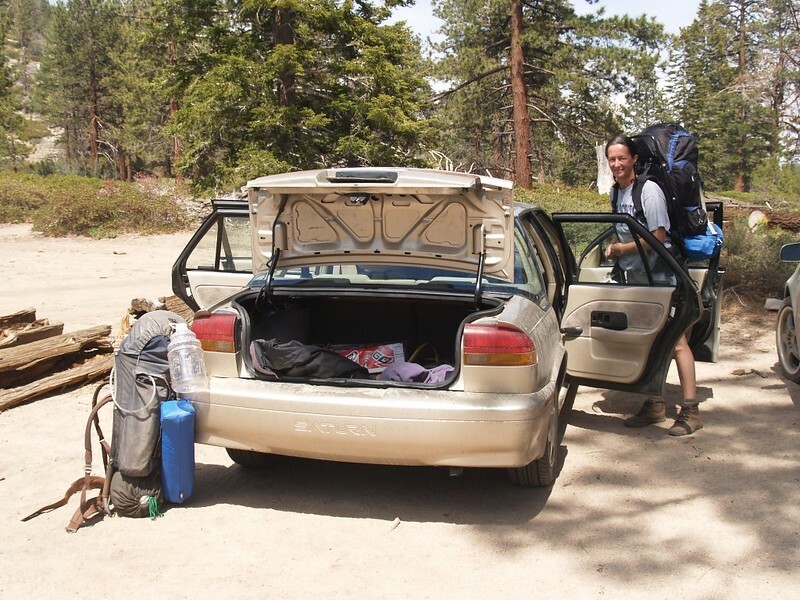 The whole point of this trip, besides having fun, was to test out our gear and make sure that everything (including ourselves) was ready for the week-long Sierra Trek we had planned for August. 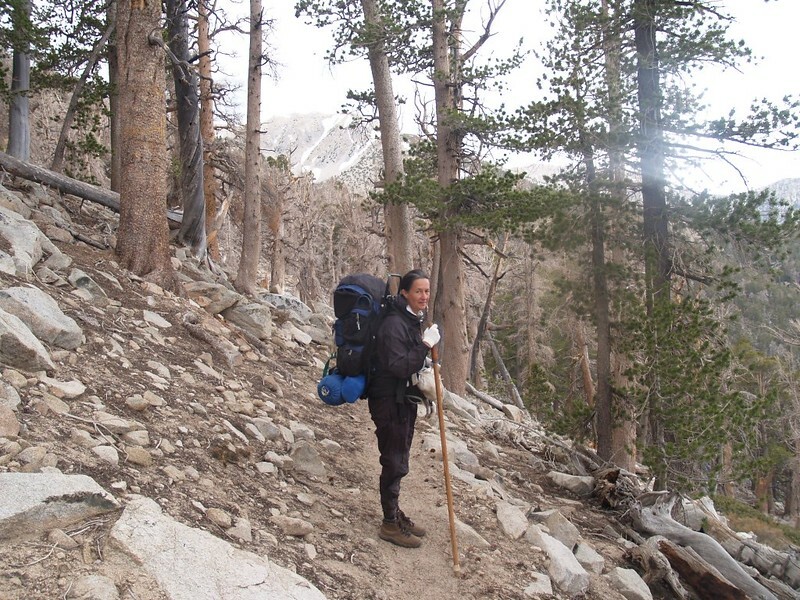 The two of us had been backpacking for years and years, not only before we had kids but also with the Boy Scouts and Girl Scouts while the kids were growing up, so we had plenty of experience. But, just the same, it had been several years since only the two of us had gone camping together. We realized the sad truth: That ever since the kids had grown up, we hadn’t done much of anything except work. It was intolerable, once we thought about it. And we also realized that the only way we were going to keep backpacking was if we scheduled and organized everything ourselves. And that’s exactly what we did. We had to research places to go. We had to get permits. We had to buy freeze-dried food. We had to make sure of our gear. We didn’t want to spend a fortune on it either, so we used our old gear. It wasn’t all new and ultra-light and fancy, but it would get the job done. 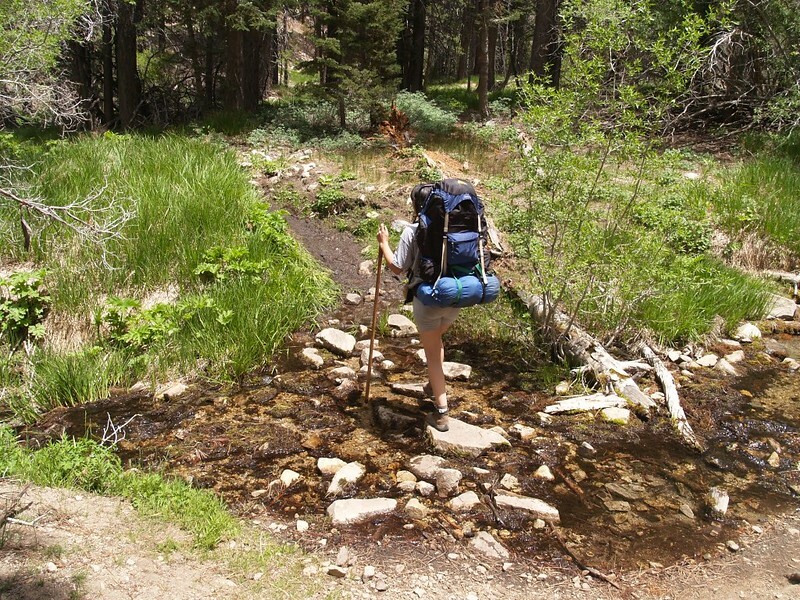 Maybe someday, when we were rich, or when we were absolutely sure that we wanted to keep doing lots of backpacking together, maybe then we’d splurge on a few choice pieces of extra-lightweight gear to make things easier on ourselves. But not now. However, we did buy one nice new item: A handheld GPS unit. After quite a bit of research on the internet, I finally chose a Delorme PN-40. It was several hundred dollars, but it came with everything we’d need. As a real “map nerd” and technophile, I’d been lusting after one of these toys for years. And it wasn’t because I was worried about getting lost, as I was an expert at orienteering with a map and compass. No, what I wanted from this device was the ability to record the tracks of our hikes, and to use those tracks to geolocate my photos and view them using the Google Earth software on my computer. I also intended to post some of those photos online so that others could find them while they were researching their own backpacking trips. I was doing my part to “pay back” and join many others who had posted similar photos before me. Plus, it was fun! 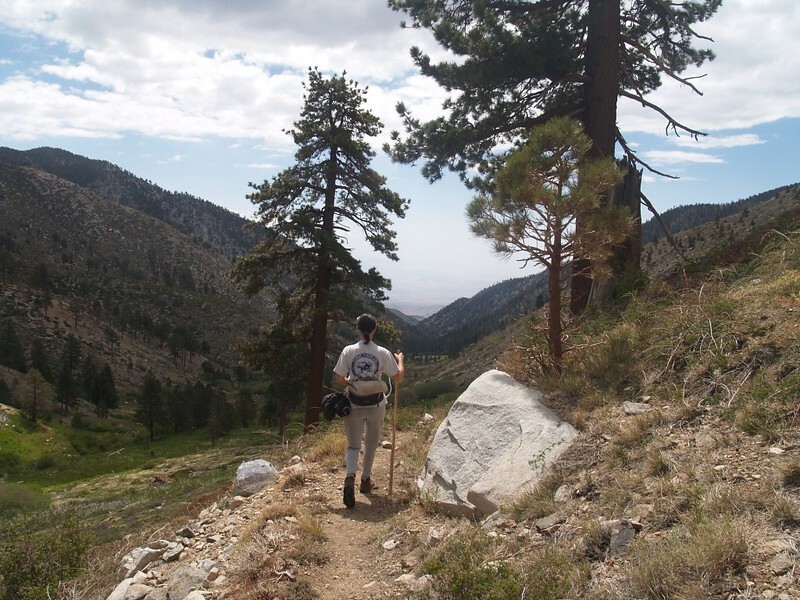 We decided to begin the 2009 hiking season by hiking in the San Gorgonio Wilderness over Memorial Day Weekend. We figured that most of the snow would be melted by then, and, with a bit of luck, it wouldn’t be freezing cold that weekend way up there at 9000 feet elevation. 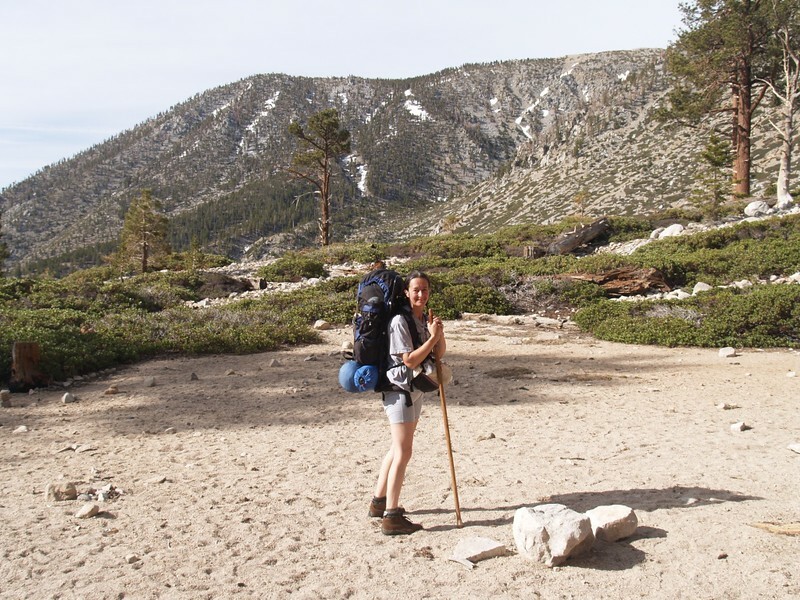 I admit that I wasn’t all that confident in my planning skills, so I cheated a bit and simply re-did one of the backpacking trips we’d done a few years back with the Boy Scouts. Remember: We weren’t looking for surprises with this trip. We simply wanted to test our gear. But in a really nice place. And that’s exactly what we did. We left San Diego at 3am and arrived at the Fish Creek Trailhead at 6:30, an hour or so after dawn. 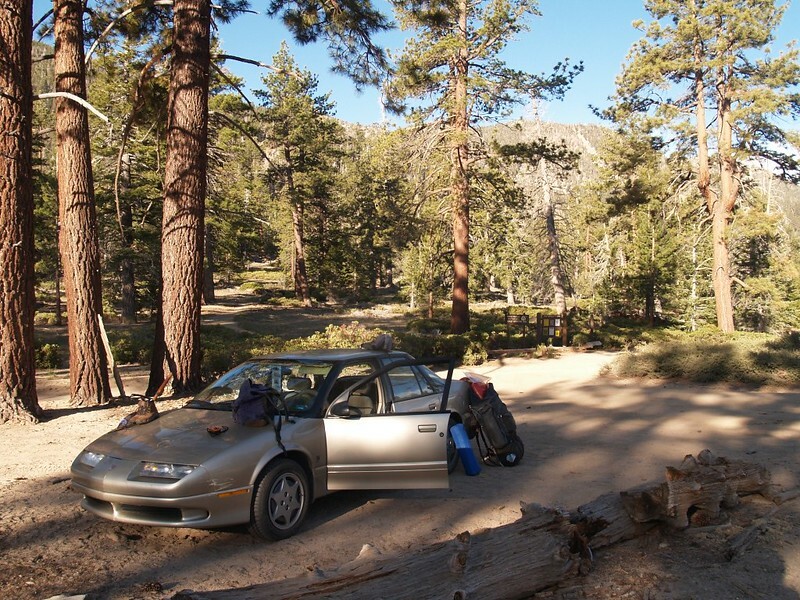 The parking area was at the end of a very long dirt road which took more than hour to reach from the nearest highway. 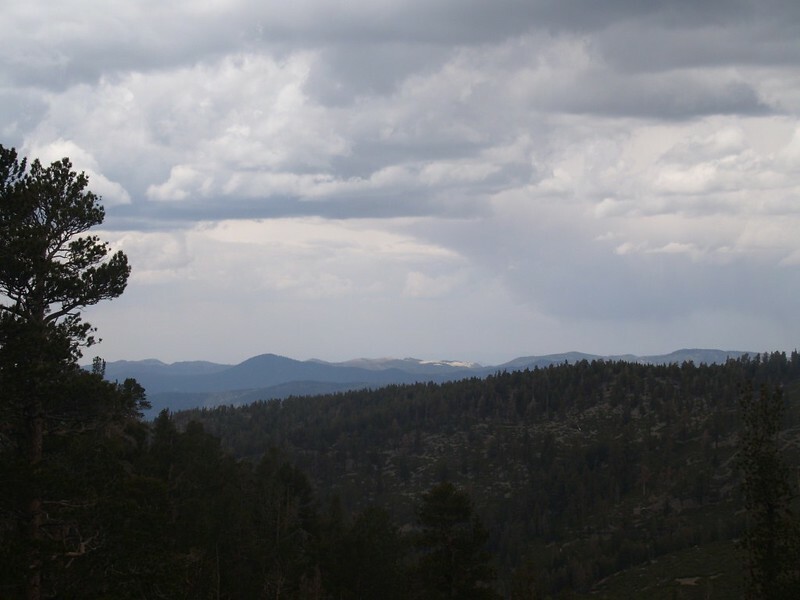 It was worth the drive, however, as we were starting our hike up at 8000 feet elevation! 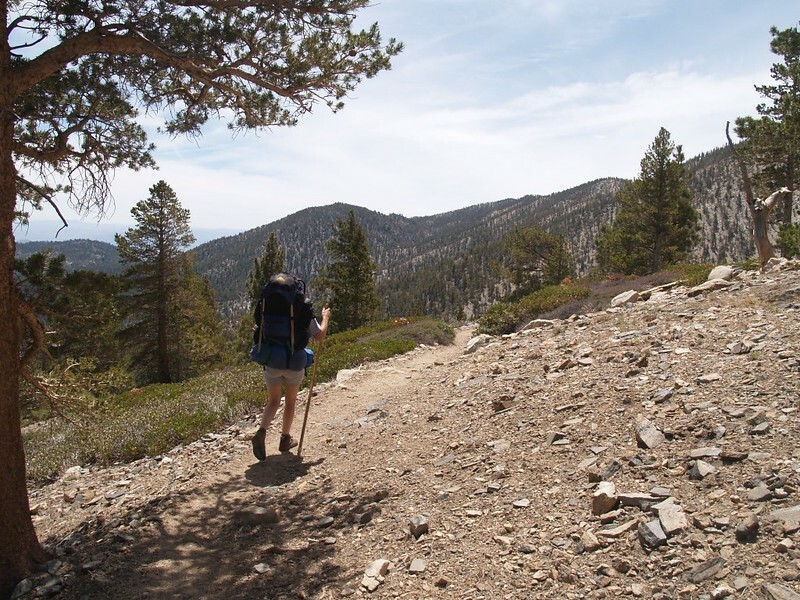 Most of the other trails in the San Gorgonio Wilderness began down near 6000 feet, and entailed much more climbing than two out-of-practice backpackers desired. It was a beautiful morning and the sky was clear. The pines were tall and fragrant. It felt great just to breath the air. Life was good again! Yes, indeed. This was where we belonged. Why had we ever stopped doing this? We put on our packs and started hiking. At first the trail went gently downhill, which made it super-easy. It wandered along the edge of Fish Creek Meadow, which was a lovely sight to see, full of green grass and flowers. We passed the intersection with the Aspen Grove Trail and then the trail began climbing. 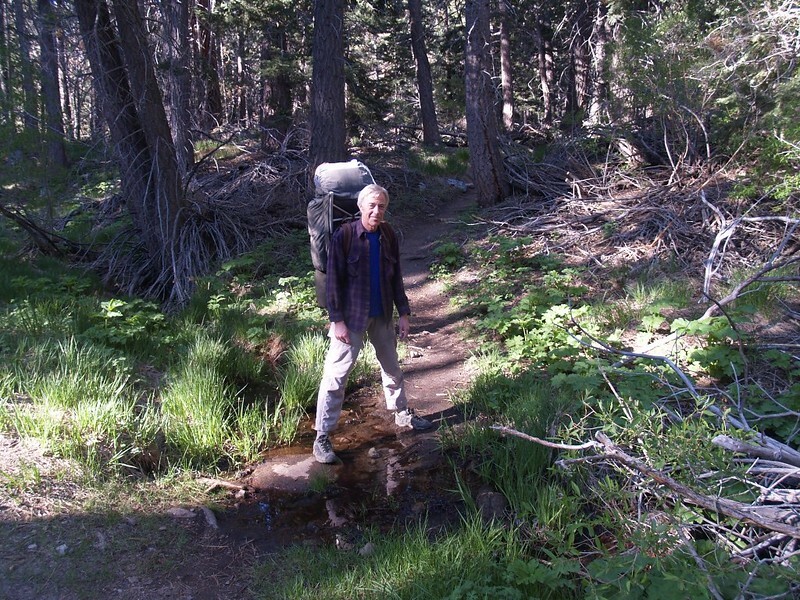 We crossed a couple of small streamlets, and continued onward to the upper meadow. Fish Creek itself was slowly flowing down into the meadow, and just above that was the Fish Creek Campsite. We looked down at it from above (it was nestled in the valley floor) but we didn’t stop to rest. Not stopping for a rest may have been a mistake, because the trail began climbing in earnest at that point. It switchbacked up an exposed, southeast-facing slope, and the sun was beating down on us quite strongly. We were sweating with the effort, and took short breaks to cool off in the shade of an occasional tree as we hiked along. Just the same, we were slow. As the morning passed by, the cumulus clouds continued to puff up all around the mountains. These provided some much needed shade. We took a long snack break at a viewpoint that looked back at the long dirt road that we drove on earlier. This break was more than necessary, as we’d been up since the wee hours and were running out of energy. We powered down some food and water and kicked back near some nice boulders where there was a decent breeze. Vicki looked like she wanted to quit, but when I asked her she said no, that all she needed was a rest and she’d be fine. So that’s what we did. And then it was time to keep on climbing. 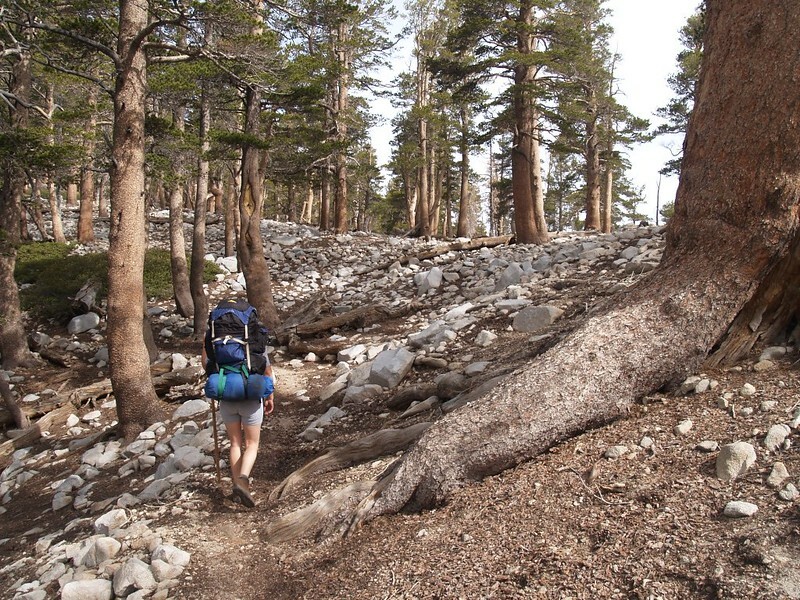 The trail headed directly for Fish Creek Saddle, where there was another campsite. The views got better as we ascended, and eventually a snowy mountaintop appeared in the distance. 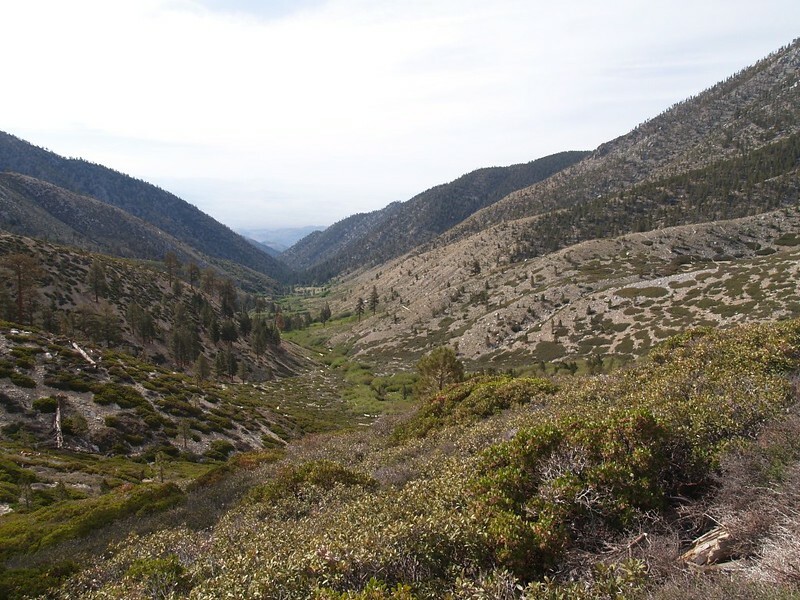 San Gorgonio Mountain! 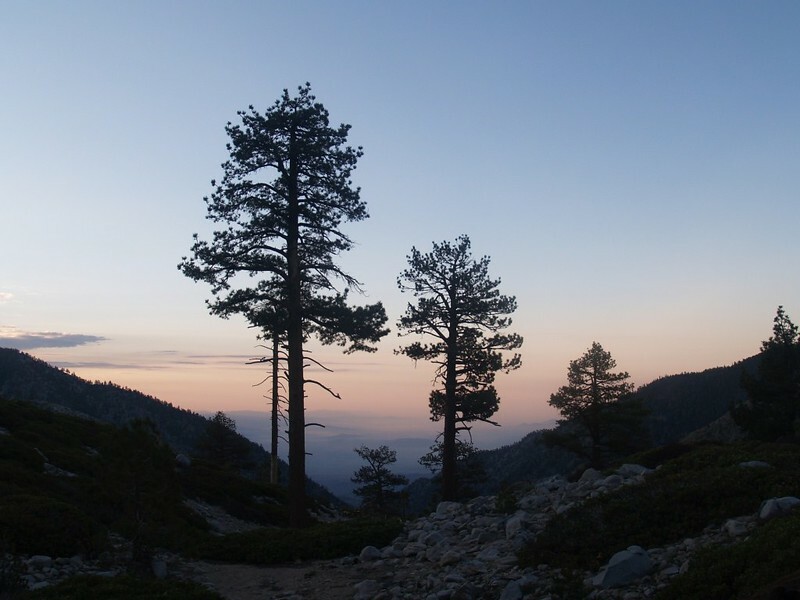 At 11,500 feet elevation, it is the tallest mountain in Southern California. We’d been to the summit in the past, but weren’t too sure about climbing it this time, what with all that snow. Still, it was great to see the peak, and it brought back lots of memories. We arrived at Fish Creek Saddle at noon. We’d hiked five miles in five hours, plus 1900 feet of climbing. Not bad! Not bad at all! We stopped and ate some lunch, but didn’t stay there very long. The clouds had continued growing all morning and now filled the sky completely. In fact, it began to look positively stormy. Now that the climbing phase of the hike was finished, we cooled down rapidly. After I assured her that the uphill agony was over, Vicki decided that she would put on another layer of clothing. She got out her brand new goretex rain jacket and pants. And so did I. OK, I have to confess: I fibbed. Maybe we did buy some new gear this year. Between the GPS and the high tech raingear, we probably spent close to eight hundred dollars. But all of the rest of our stuff was older. Really. We continued hiking, traversing along the side of Lake Peak. 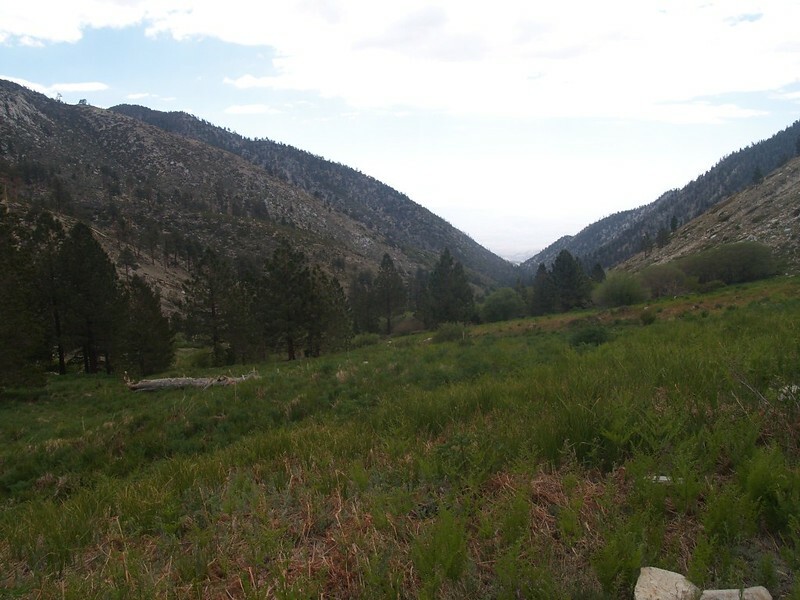 We had fine views north toward Big Bear, and Dry Lake was nestled in the valley down below us. There was a breeze up here, and it felt cold. 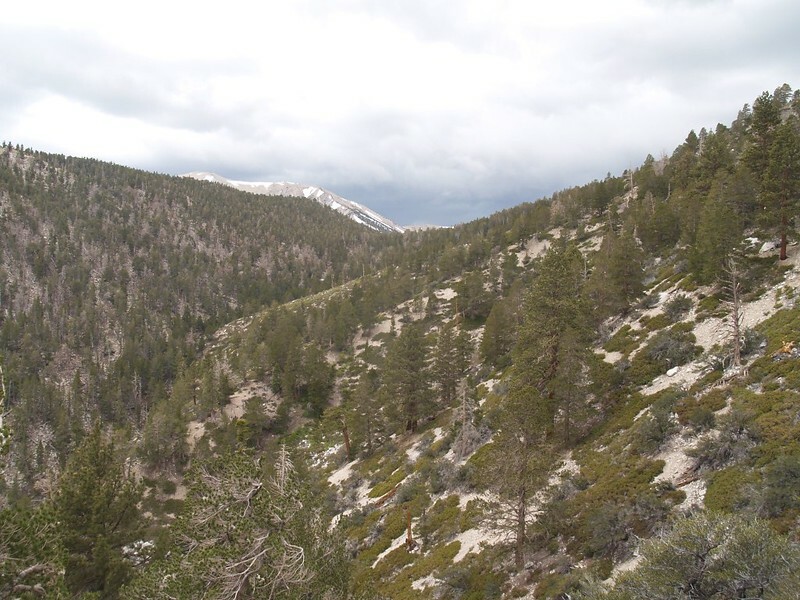 It didn’t help that we could see all that snow in the chutes on the northeast slopes of San Gorgonio and Jepson. It made us shiver just looking at it. 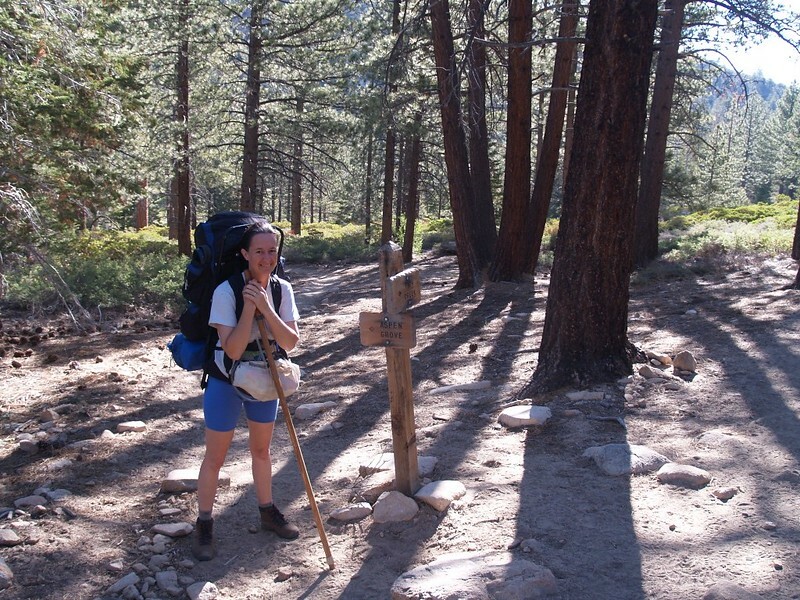 After the easily-hiked traverse, we arrived at Lodgepole Saddle and turned left onto the North Fork Meadows Trail. 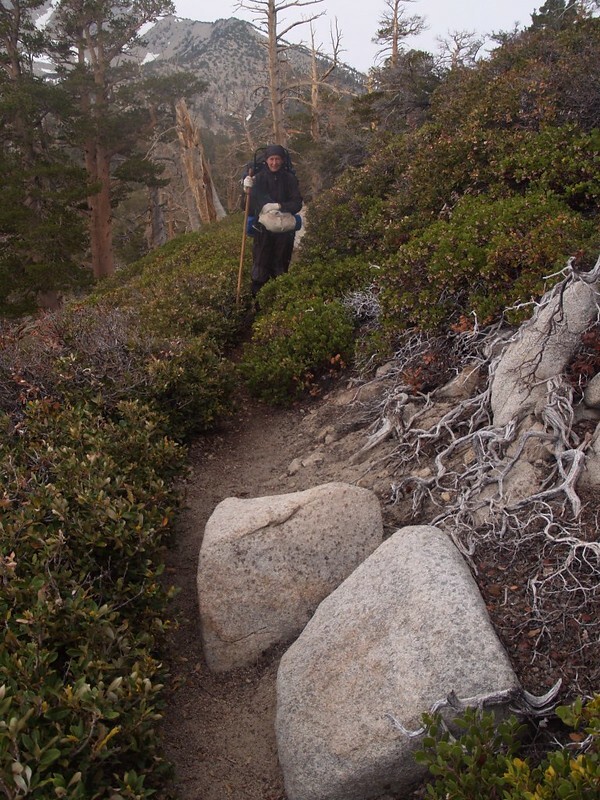 We began descending toward our camp at Mineshaft Flat. It was sad to lose 650 feet of the 1900 feet of elevation that we’d climbed earlier, but there wasn’t much we could do about it. Except enjoy the downhill hiking, of course. We’d have to deal with climbing back out two days later, but hopefully we’d be fresh by then. For now, it was enough to know that our campsite wasn’t much further away. Naturally, when we were climbing earlier, the sun was out and we were roasting and sweating. Now that we weren’t climbing and could use some warmth, the clouds covered the sun completely. About halfway down the trail, it even began raining! It didn’t rain much, but the drops were big and they were able to spatter everything around us. Including our new raingear! We laughed as we watched the drops beading up on the goretex. All of the gear in our packs was safe inside plastic bags, so we simply continued hiking, smiling to ourselves and inhaling the aromatic smell of rain in the forest. It was dry and almost sunny when we arrived at the campground. We were happy to see that we were the only ones there, although we doubted that our solitude would last, seeing as this was Saturday on Memorial Day Weekend. Just the same, we got to pick out the best campsite. We got out the tent right away and set it up, then threw our clothing, pads, and sleeping bags inside. And we were just in time! The big cloud drifted back overhead and began sprinkling on everything once again. 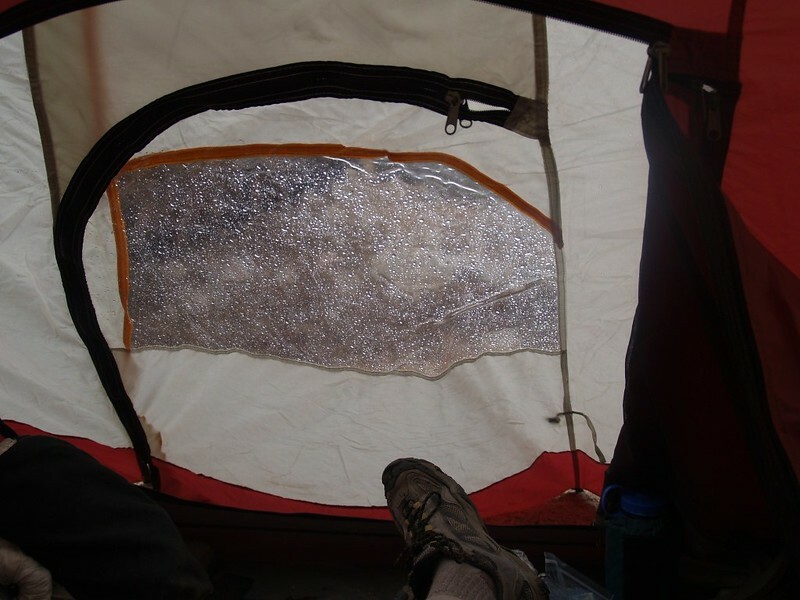 We joined our gear in the tent, then watched the raindrops spotting the clear plastic window on the door and listened to them spattering the tarp up above. It sure was cozy in there, all snug and dry and warm. We heard a rumble or two of thunder and saw a couple of flashes, but we felt safe down here in this valley. However, as before, the rain didn’t last for long. 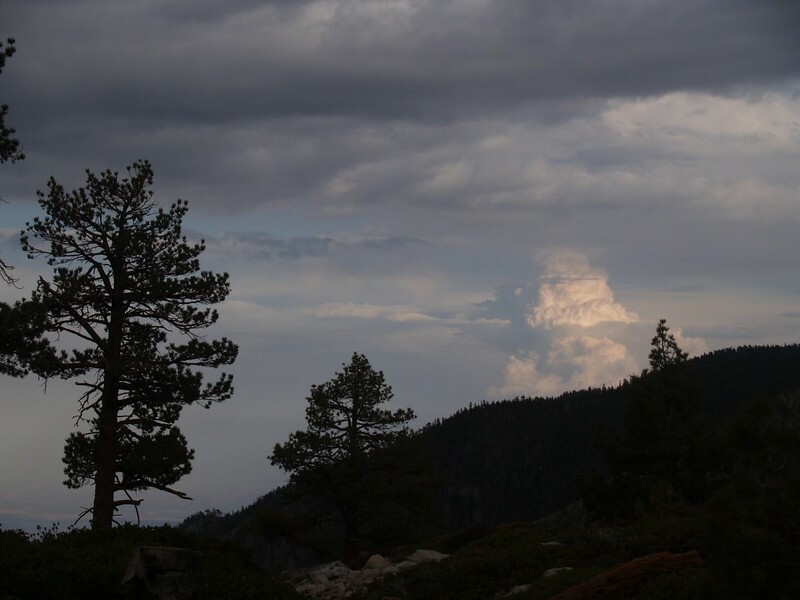 It was merely a typical afternoon thundershower in the mountains, doomed to dissipate as quickly as it had formed. We went back outside but the air had cooled, so we cooked up some hot ramen soup and tea to warm our insides. 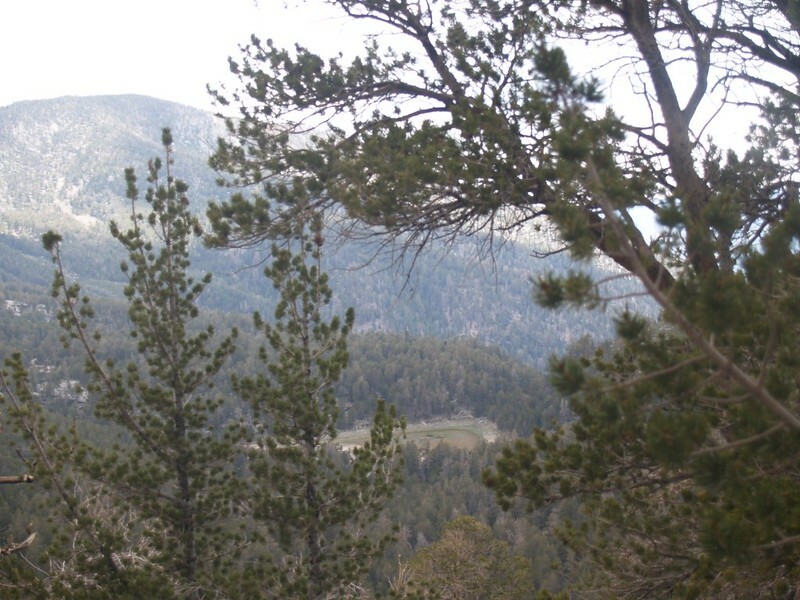 Then it was time to go get more water at Mineshaft Spring, which was located about a quarter-mile downhill in the canyon. It wasn’t easy to find the actual spring, but it helped that we’d been here before. The water gushes directly out of the ground and it is seriously cold, especially in the Springtime when there are still patches of snow in the chute directly above it. We probably didn’t need to filter this water (since it came out of the ground directly) but Vicki wasn’t taking any chances. She pumped away until we’d filled our gallon jug and other containers. It was my job to carry all that weight back uphill to the campsite. After that, it was dinner time. 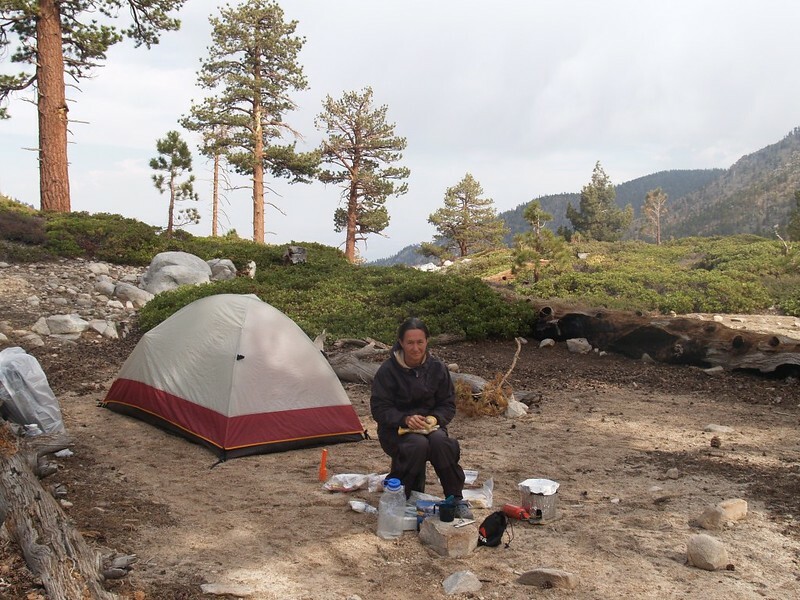 Vicki whipped up some boiled water for a freeze-dried meal and we sat outside eating it, watching the clouds and sky in the distance, where a big thunderhead was still standing tall above San Jacinto Peak to the south. There was probably another one towering similarly, way up high above us, but we could only see the dark gray bottom of the cloud from here. After that it was time for bed. We’d gotten up super-early that morning, so we were more than ready to hit the sack. In fact, it was still light when we went to bed, and we fell asleep even over the noise of the Boy Scout Troop that had arrived while we were eating dinner. Now, that’s tired! I woke up at first light and headed outside with my camera, hoping to get a good sunrise shot, but the clouds weren’t right. I took the photo anyway, of course, but then the cold air drove me back into the tent. 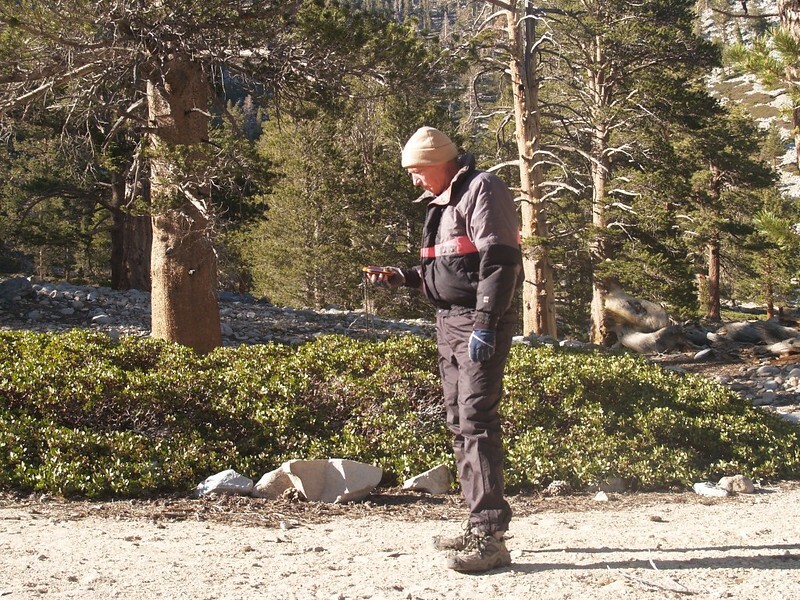 I had been hoping to get an early start on a day-hike to the summit of San Gorgonio, but all the snow we saw up there on yesterday’s hike made that idea less exciting somehow. Especially to Vicki. She was snuggled into the sleeping bag, and when I asked her about it she sounded extremely unenthused. Especially when I casually mentioned that it was only 2300 feet of climbing and a thirteen mile round-trip to get there. Just think of the fun we could have on the snow! But no. Her only goal in life was to stay inside the tent until the sun rose high enough to warm the air inside it. What a lazybones, I realized. I sighed in resignation. What was a man to do? She didn’t leave me much choice, now did she? So I got back into the sleeping bag and joined her. The sun rose over the top of Ten Thousand Foot Ridge and lit up the tent. It grew warm inside and we got dressed for the day. We put on our raingear to keep off the residual chill and went outside. It was a fine looking day. 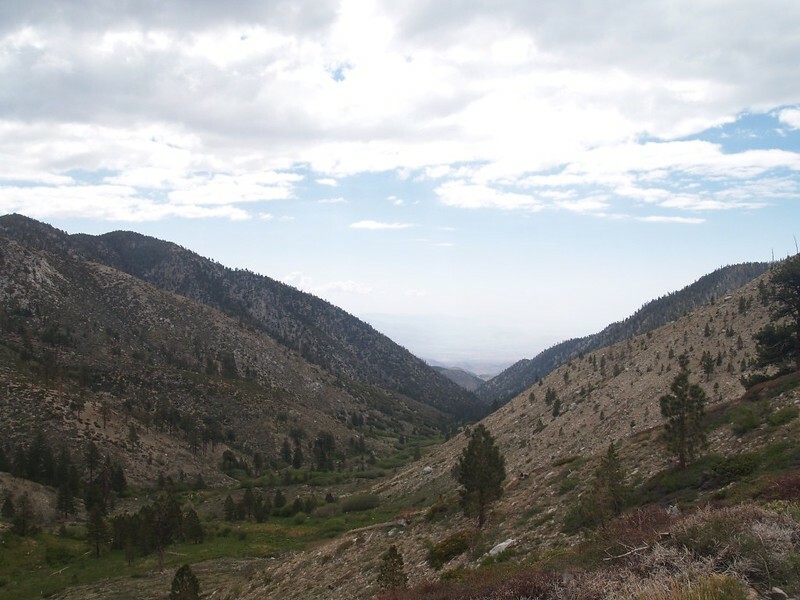 There was snow shining white in the chutes of San Gorgonio Mountain to the southwest, and a few puffy clouds were already forming behind us at the saddle. We made some breakfast as we listened to the Boy Scout troop waking up and getting ready. We figured that most of them would bag the summit today. But not us. 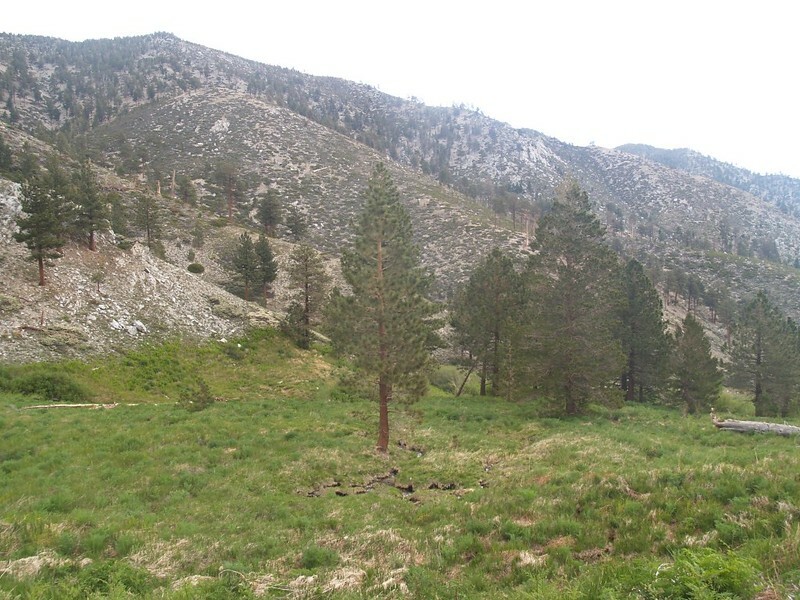 Our plan was to day-hike down the valley to the Big Tree Campsite, which, according to the map, was somewhere below us in North Fork Meadows. We got our gear together. Vicki had a fanny pack and I had a day pack. We brought some lunch, water, water filter, and our raingear in case those clouds tried a repeat of yesterday. Then we headed down the trail. This was going to be an easy, relaxing day in the wilderness. The trail stayed high on the side of the valley, but even though it was well-made, you could tell that it didn’t get much foot traffic. And why would it? 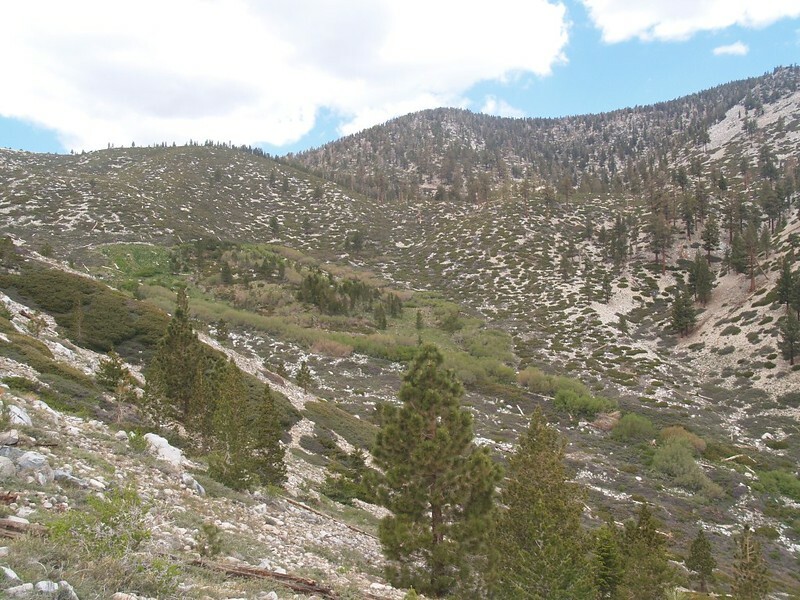 Not many people wanted to hike even further downhill than Mineshaft Flat to camp, knowing that they’d have to carry heavy backpacks all the way up again. And Mineshaft Flat was large enough for plenty of tents. Eventually, the trail headed down into the bottom of the valley, in the “meadow” section, and the grasses and bushes were much greener. They were growing so well that they were successfully taking over the trail, which became more and more difficult to follow. I kept pulling out my GPS to see if it could help with our navigation, but it didn’t do a whole lot of good. Our track and the map’s track were not exactly one to one when I zoomed in on our location. We also figured that it would be easy to spot the actual “Big Tree” itself, but it managed to elude us. Maybe it was this nice pine over here, or maybe that big one over there. 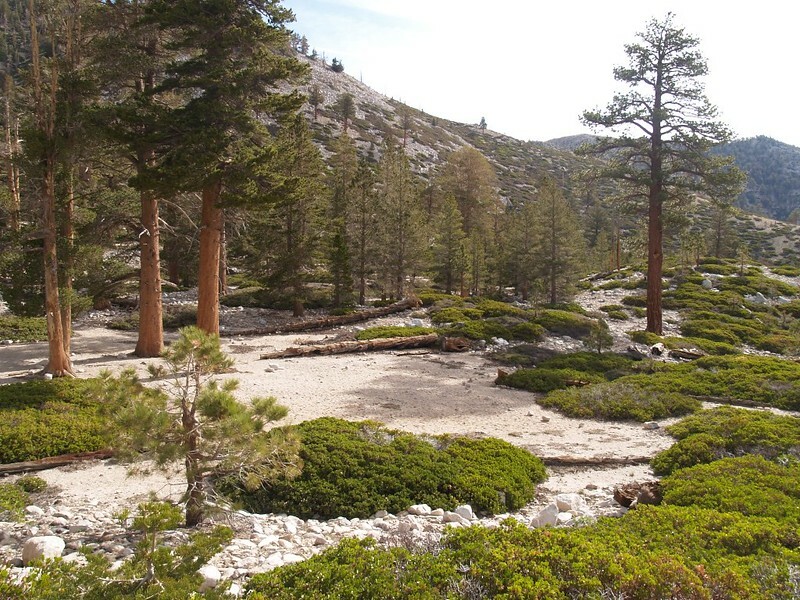 Then we realized that most of the pines were relatively young, and this campsite had probably been around for at least fifty years. 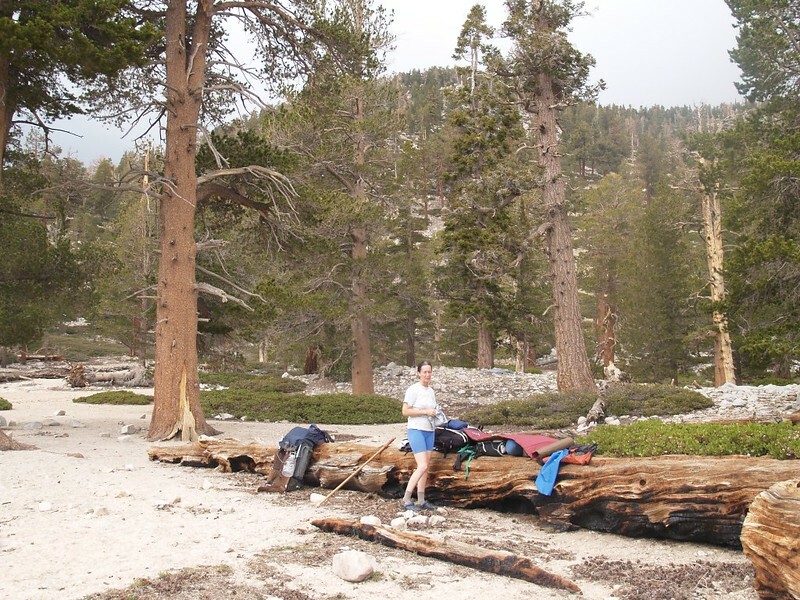 We saw a couple of huge fallen trees just lying there, being eaten by termites, slowly rotting into the meadow, but none of them had a convenient, engraved wooden sign attached to them like all of the other campsites and trails we’d seen thus far. And, to top it all off, there was no obvious clearing where you might set up your tent and camp. The ground was lumpy and bumpy and green with tufts of grass. We decided that we’d hiked far enough at that point, so we stopped and had some snack. It really was a pleasant spot to camp, we decided. Everything was growing well, and there was a stream for water not far away. If you really wanted some solitude in the wilderness, then camping down here on this dead-end trail was the perfect spot. 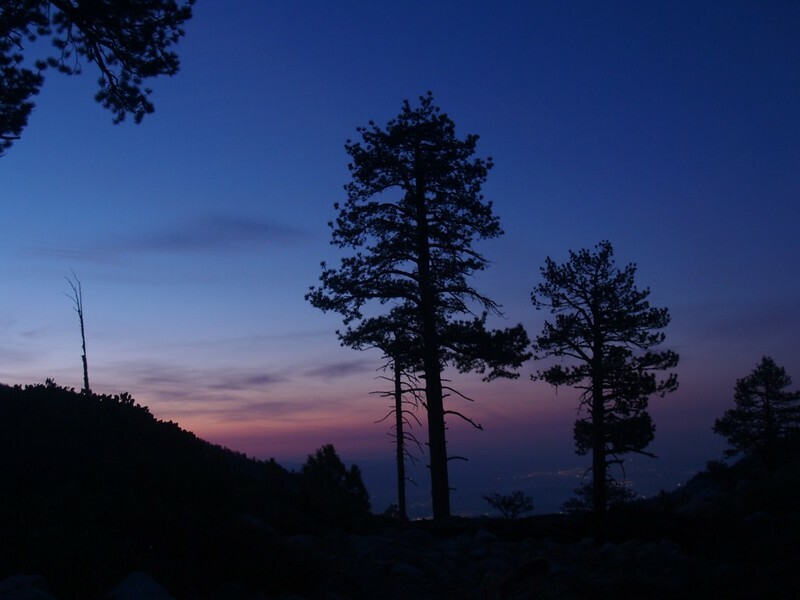 Only silly people like us who were too lazy to climb all the way up San Gorgonio Mountain would ever bother to visit. North Fork Meadows and the Big Tree Camp is somewhere around here, but which one is the Big Tree? That dead log? 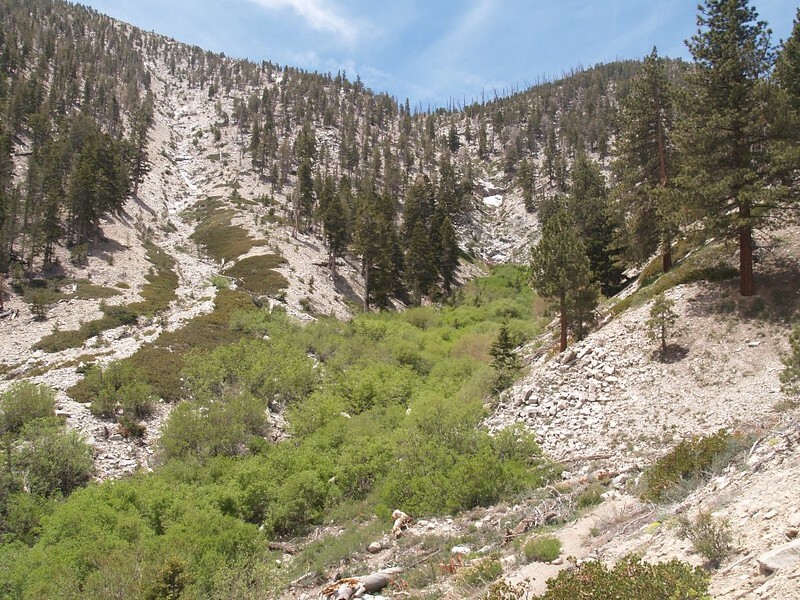 On the way back up the valley to camp we stopped once more at Mineshaft Spring. 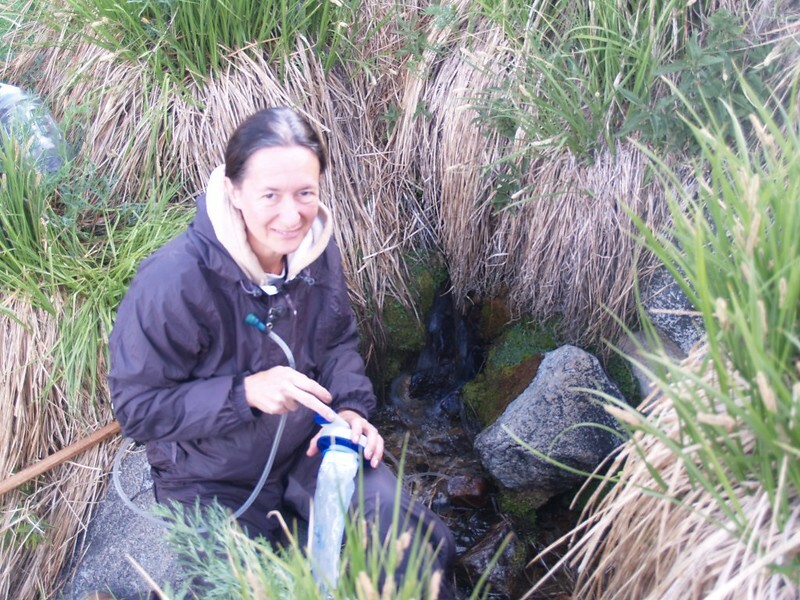 We filtered enough water to make it through dinner, breakfast, and the hike back out the next day. We were lazy, as I’ve mentioned, and had absolutely no intention of hiking back down here a third time. We came into camp and ate our lunch, then retired to the tent for some reading. The clouds that had been building all morning gave up and blew themselves away. No rain for us today. And then the sun roasted us out of our tent. It was hot in there! Vicki grabbed her sleeping pad and dragged it outside. She placed it on the soft sand and continued her nap in the sun. The little bit of cool breeze made it feel just right, and perfect for sleeping. I read my book while sitting on a big log, but even that grew old after awhile, so I got out my new GPS and started trying out some of its features. I calibrated the electronic compass and took bearings on distant peaks. I zoomed in and out on the map and drove the cursor around the screen, measuring distances and positions of peaks that I couldn’t even see. I checked out the unit’s barometric altimeter, but came to the conclusion that it was relatively useless, considering that it had a perfectly good topographic map on the screen with a more accurate digital display of your altitude (based on your position on the map). It must have sounded like a selling point to their marketing department. In the interest of science, I marked another official waypoint right here at our campsite. I’d test its accuracy later on when I got home to the mapping software on my computer. After that, Vicki woke up and boiled some water for dinner. We took the meal and our books up on the little ridge nearby where we had a great view down into the valley. Once again, we tried to see if we could tell which tree was the Big Tree, but it was impossible. After dinner, we took a walk around the campsite and tried to imagine where the original Mineshaft was, but it was just as impossible to find. We began to wonder about the people who named things around here. We said hello to the Boy Scouts and wanted to ask them how their day went, but they were too busy running around and having fun. And the adults were totally whupped and exhausted, so we left them alone. As the sun set beyond the mountain our valley sunk into shadow and the temperature began dropping rapidly. We decided that we’d walked enough for one day and headed for bed early once more. After all that extra sleeping, we had no trouble waking up at first light. I went outside with my camera and took some pre-dawn tree silhouette photos while looking down the valley with the lights of Desert Hot Springs in the distance. It was peaceful in the cool, still air. The Boy Scouts were still asleep, and we liked it that way. So we decided to get the jump on them and show them how real backpackers get moving in the morning: They wake up at first light, eat breakfast at sunrise, and leave camp soon afterward. And that’s exactly what we did. They were barely stirring by the time we started hiking up the trail to Lodgepole Saddle. Our empty campsite. Good-bye, Mineshaft Flat! Hiking uphill in the cool morning air was a great idea, and it only took us an hour or so to reach the saddle. We stopped and took a break for a while. We adjusted our shoes and tightened the laces for the long downhill hike that was ahead of us, to prevent our toenails from slamming into the front of our shoes, and hopefully to avoid blistering. We still had six miles left to hike, so we didn’t wait around very long. 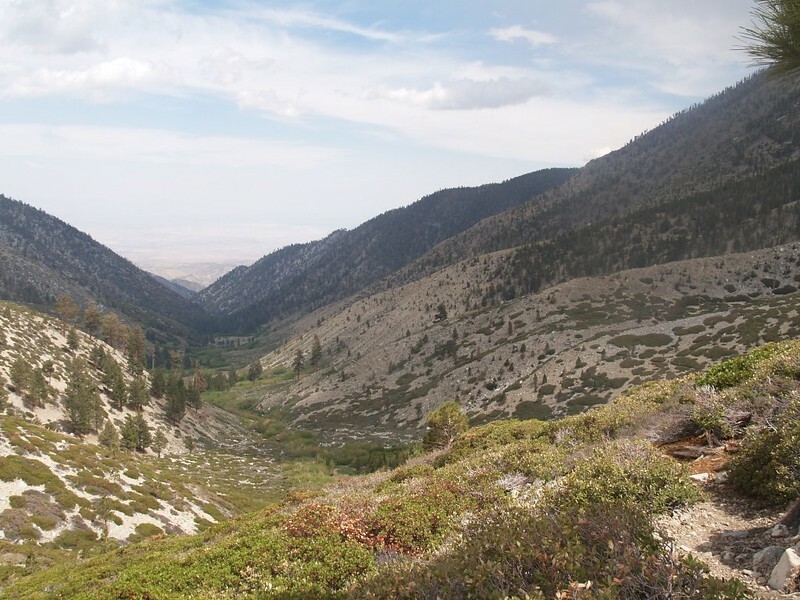 We traversed along to Fish Creek Saddle, then began the long descent. The trail was exposed in many places, and the sun beat down on us, but it was still fairly easy hiking. 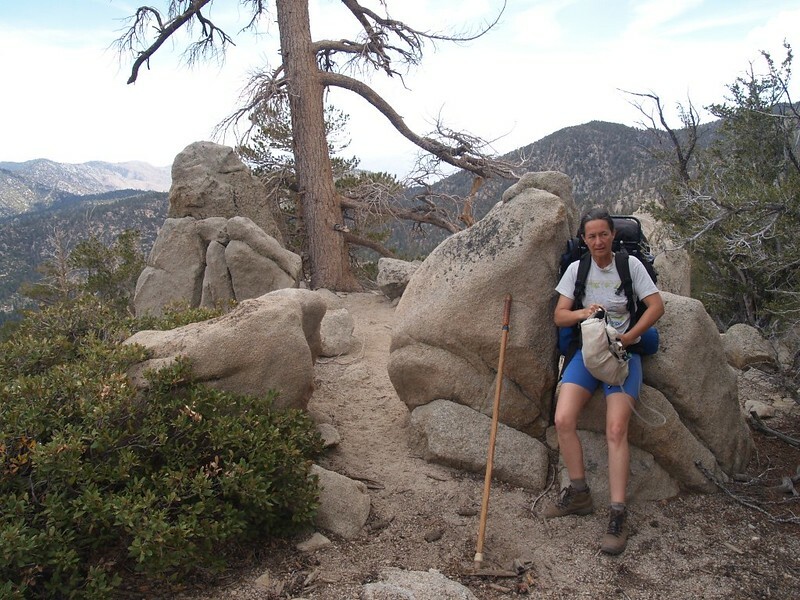 Vicki was feeling much better acclimated to the elevation, and had much less trouble getting enough oxygen compared to the hike in, two days ago. She was really enjoying it, and so was I. 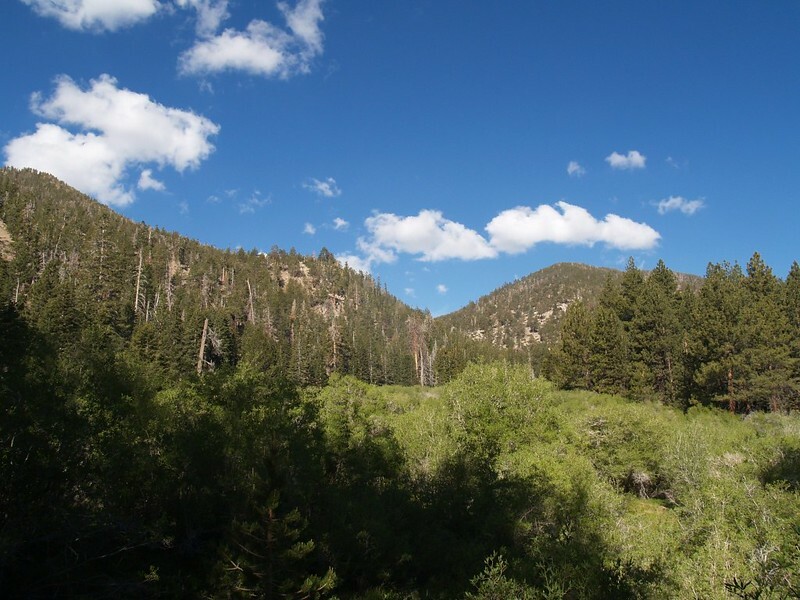 It had been far too long since we’d done any real backpacking, and our experience at Mineshaft flat made us realize that we certainly didn’t miss all the noise and rambunctiousness of hiking with the Boy Scouts. We decided that we’d be just fine in the future, backpacking as a team of two. 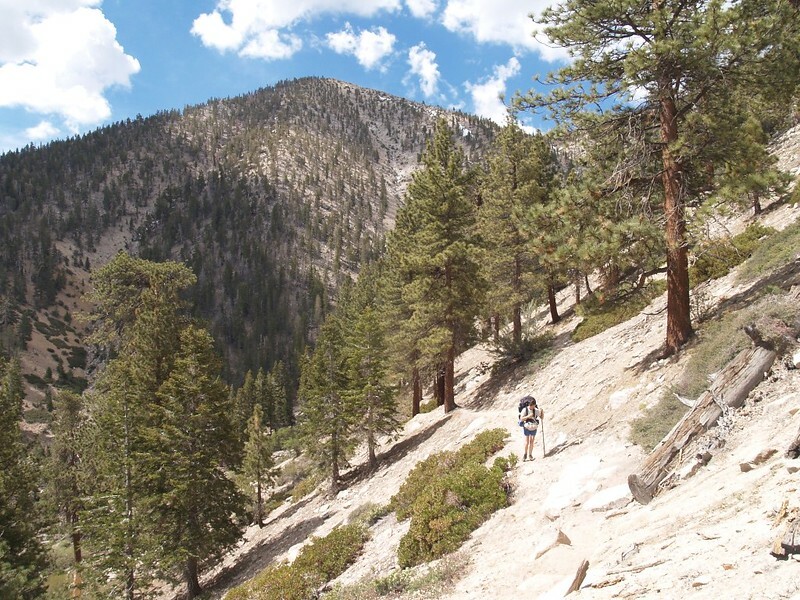 It’s much more enjoyable to descend the Fish Creek Trail than climb it – faster, too! It was getting toward noon when we arrived at Fish Creek Meadows, so we decided to take a side excursion down the Aspen Grove Trail. Vicki wanted to see the aspens, but once the trail began descending significantly we realized we’d have to climb back up, and that wasn’t part of the plan. So, on the way back to the main trail we headed off-trail over to the lower meadow. It was grassy like a proper meadow, not full of bushes like the upper meadows. We sat down on the edge under some pine trees and got out our lunch. This was our last chance to simply relax in the wilderness. We read our books and leaned back on the grassy slope. We talked about the trip, and concluded that our gear did just fine. There had been no issues whatsoever with any of it. 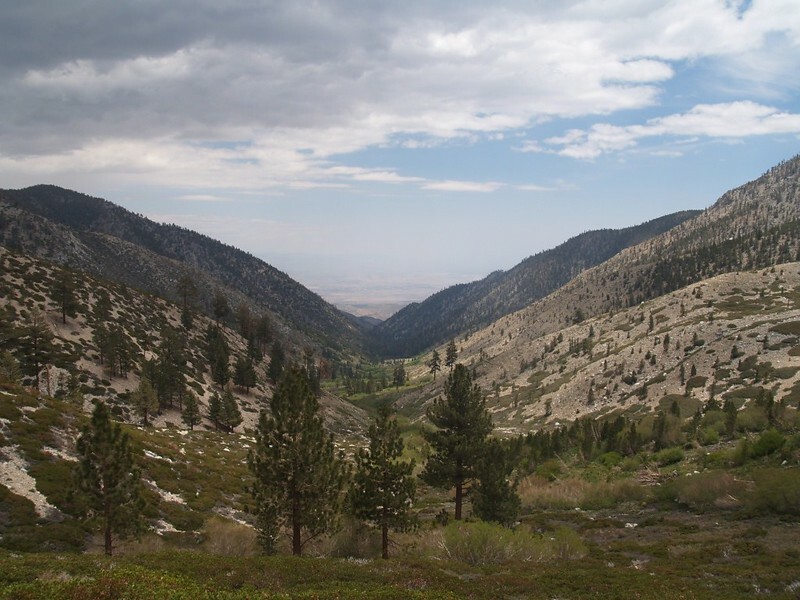 We were also getting excited about our upcoming trips to San Jacinto in July, and the big one, a week-long trek in Kings Canyon National Park. All we needed to do now was to buy enough freeze-dried food. And maybe buy another, bigger, bear-proof canister. Vicki already had one, but I didn’t, and a week’s worth of food required the extra volume. More new gear? Excellent! Now I had something to research and shop for, which was always fun.